A Ciphertext-Policy Attribute-Based Proxy Re-Encryption (CP-ABPRE) employs the PRE technology in the attribute-based encryption cryptographic setting, in which the proxy is allowed to convert an encryption under an access policy to another encryption under a new access policy. CP-ABPRE is applicable to many real world applications, such as network data sharing. The existing CP-ABPRE systems, however, leave how to achieve adaptive CCA security as an interesting open problem. 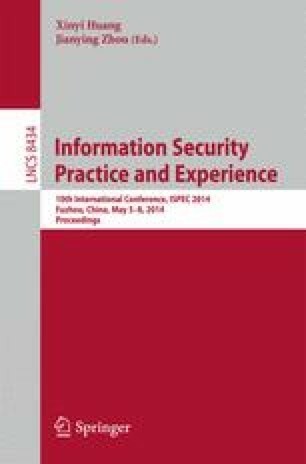 This paper, for the first time, proposes a new CP-ABPRE to tackle the problem by integrating the dual system encryption technology with selective proof technique. The new scheme supports any monotonic access structures. Although our scheme is built in the composite order bilinear group, it is proven adaptively CCA secure in the standard model without jeopardizing the expressiveness of access policy.